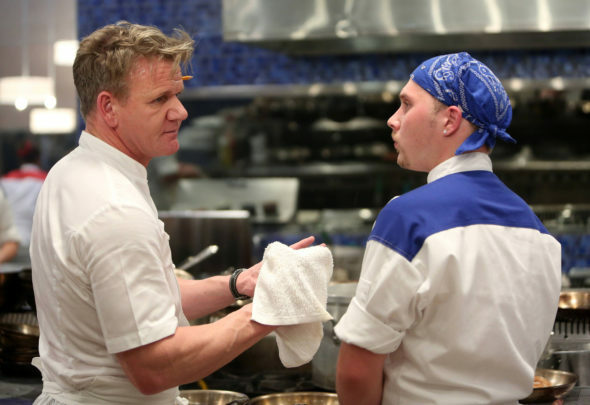 HELL’S KITCHEN: L-R: Chef / host Gordon Ramsay and contestant Matt in the all-new “Let The Catfights Begin” episode of HELL’s KITCHEN airing Friday, Nov. 4 (8:00-9:01 PM ET/PT) on FOX. Cr: Greg Gayne / FOX. © 2016 FOX Broadcasting Co.
Friday, November 4, 2016 ratings — New episodes: Hell’s Kitchen, The Exorcist, MacGyver, Hawaii Five-0, Blue Bloods, The Vampire Diaries, Crazy Ex-Girlfriend, Dr. Ken, Last Man Standing, Shark Tank, 20/20. Reruns: (none).